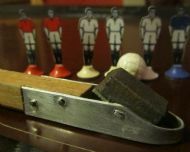 A very early version of the game that uses the magnet and pitch format but includes original Subbuteo type celluloid players. 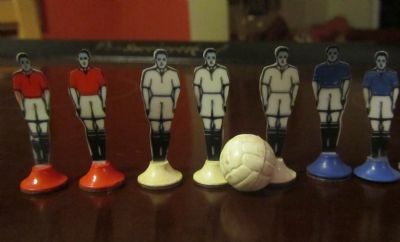 Definitely original these figures are miniature versions of the Subbuteo figures on unique bases. 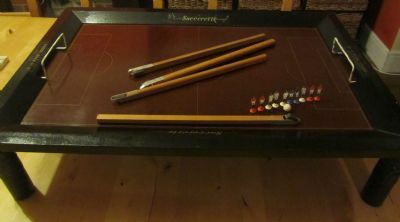 Gorgeous brown bakelite pitch with black wood surround. Lovely showpiece with box (tatty) and all parts. The pitch surround has great graphics, visible in this mean and moody photographic presentation! Highly unusual celluloid figures exactly like Subbuteo figures only smaller in unique bases. I'm glad you asked, this set is for 2 to 4 operators. 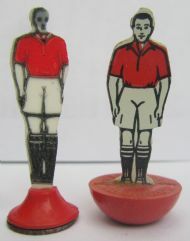 The figure on the left is the Soccerette player and the other is a Subbuteo celluloid player. 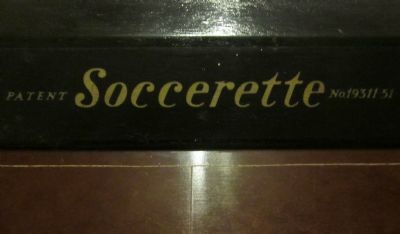 Very similar but short lived production from Soccerette. The figures are controlled by magnetic rods under the pitch. The circular ball does however retain a mind of its own.